Have you or a family member been coughing excessively, feeling fatigued, and had shortness of breath? You may be suffering from acute or chronic bronchitis. To be sure, visit Montgomery Medical Clinic for a bronchitis diagnosis and treatment in Gaithersburg, MD. Backed by many years of experience, our primary and urgent care staff is readily available to provide you with the complete care you need to recover bronchitis. Have you or a family member been coughing excessively, feeling fatigued, and had shortness of breath? You may be suffering from acute or chronic bronchitis. To be sure, visit Montgomery Medical Clinic for a bronchitis diagnosis and treatment in Gaithersburg, MD. Backed by many years of experience, our primary and urgent care staff is readily available to provide you with the complete care you need to recover bronchitis. 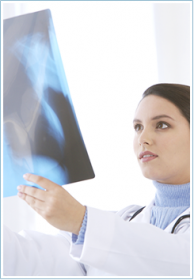 Chest X-Rays—Radiographs (X-rays) can help to determine the cause of your cough. They are often ordered for severe bronchitis and pneumonia. Sputum Tests—Doctors use these to test the mucus (sputum) for whooping cough (pertussis), bronchitis, or other illnesses. Sputum tests are also used to test for allergies. Pulmonary Function Tests—During the test, you blow into a spirometer to measure how much air your lungs can hold, as well as the rate of which you can get the air out of your lungs. These assessments are used to test for bronchitis, asthma, and emphysema. You can recover from acute bronchitis without the need for medical treatment in about two weeks. Some cases of bronchitis, however, require bronchitis treatment for patients to make a full recovery. Bronchitis is usually the result of a viral infection, meaning antibiotics are ineffective against it. Your bronchitis doctor will prescribe an antibiotic if he or she believes you are also suffering from a bacterial infection. We may also suggest cough medication to suppress your cough at bedtime, or an inhaler or other medications to reduce inflammation and open up passages to your lungs. Have you been feeling under the weather? Do your symptoms include aches, fever, coughing, and sneezing? The common cold or influenza may be the culprit! The common cold—a viral infection of your upper respiratory tract—is usually harmless, though it can be a nuisance. There are more than 100 viruses that cause the common cold, which means that the signs and symptoms vary greatly. Most sufferers recover in one or two weeks. If your health doesn’t improve, visit our bronchitis doctor for an evaluation. Unlike the common cold, influenza, if left untreated, can lead to further respiratory problems, such as pneumonia and bronchitis. This makes it one of the biggest threats to a household! We recommend getting your flu vaccine each year to minimize your chances of contracting the flu, as they are 90% effective in combating this nasty virus. Free flu vaccines are available.